This native, small bushy tree or large shrub is very tolerant of coastal, exposed, polluted and damp sites and is popular with wildlife. Crataegus monogyna offers wonderfully varied seasonal interest, starting with dark green, deeply lobed, glossy foliage that acts as a foil to fragrant single white flowers with red anthers in May. After flowering, small dark red haws are produced which are popular with the birds. Leaves turn yellow and bronze in the autumn before falling. Crataegus monogyna is often used in native hedging mixes, but as a tree you can expect a height and spread of 5 x 4 meters in 20 years. 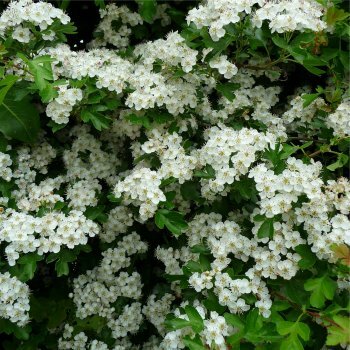 As the name suggests, Common Hawthorn has sharp thorns on its branches which provides a safe nesting place for birds. Our pot grown Common Hawthorn trees can be planted at any time of the year. Start by removing weeds and grass within a metre of your desired planting hole. Dig a square hole as deep as your root mass and approximately 2x as wide. To help the tree establish more effectively, sprinkle root grow in the hole. You can prune Common Hawthorn trees in summer, after flowering, to help maintain a clear stem. By pruning the lower branches you will raise the crown, creating a more attractive form. If it requires any tidying up, this can be done in autumn. Remove and damaged or crossing branches and ensure there is enough light reaches the inner canopy.